Mark Davis is determined to savour the experience of playing at this year's World Championship while he can. The world number 12 has never been beyond the second round at the Crucible but has reached that stage three times in his 23-year professional career. Davis, 41, told BBC Sussex: "I want to try to enjoy it a bit more than maybe I have in the past because you cannot be sure when you will get here again. "This is an amazing place to play and I want to make the most of it." Davis has reached the quarter-finals of three ranking events this season and reached the semi-finals of three ranking events last season. 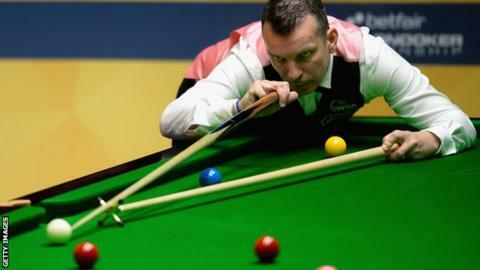 The 41-year-old has won the Six-Red World Championship for the past two seasons. He added: "I want to try to enjoy the atmosphere." Davis, from St Leonards, begins his tournament against Dominic Dale, the world number 24, on Wednesday and is wary of the threat the Welshman poses. "Dominic is one of the toughest players you can get," Davis added. "He is two-time ranking event winner. There are not many of them who have come through as qualifiers." Davis was assured of his place at snooker's showpiece event by virtue of his top-16 ranking but, despite a big improvement in the past couple of seasons, he is still seeking a first ranking event win. "The last two or three years I have had a bit of success but not as much as I would like," Davis said. "And I still haven't won a ranking event, but I would like to think I am getting quite close and it will come sooner or later. "I am here to win but also here to enjoy it as well. I feel good and cannot wait to get out there."